Two things matter today. DNA testing to establish proof of relationships and proving the blood matches the paper trail using the GPS. The Genealogical Proof Standard is the gold standard. Top researchers use these five steps to create a logical, well organized, and powerful Genealogical Proof Summary. The Board for Certification of Genealogists is an independent group without affiliation or membership in other groups. This certifying body of professionals is not a member-based society. It is autonomous and recognized nationally and internationally for setting the standard in genealogical research. The BCG website provides instruction and details on the application process. 1. Perform a reasonably exhaustive search. This means the researcher has left no stone unturned using credible documents. a. What is a Credible Document in Family Research? Proving an ancestor requires proving, at times, who the person is not. Many organizations such as the Daughters of the Revolution no longer accept family histories as credible documents. Earlier histories can contain errors. It may be necessary for the family researcher to disprove previous connections before confirming ancestors using credible documents. Without the proper documents though it is impossible to set the record straight. If the erroneous family history is placed online multiply the errors by the number of global users. An exhaustive search is an in-depth look using credible documents as a guide to place the ancestor within the context of history. Taking the time to perform this research eliminates the possibility of another researcher overturning your findings and/or analysis later. Many today are redoing their family trees, doing the history homework, in the hope of correcting the family record once for all. 2. Provide complete, accurate citations to the source or sources of each information item. Proper citations are crucial so other researchers can trace the steps involved in your research and obtain the same result. When another researcher cannot follow your research path and arrive at the same conclusion it casts a shade of doubt on the work done and conclusions drawn from the research. Forget how to properly cite a source? No problem. EasyBib is free and easy to use. 3. Tests – through processes of analysis and correlation – of all sources, information items, and evidence. Testing ensures the researcher comes to the right conclusion. Consider all the evidence careful not to omit any documents. This is where proving your ancestor may involve also proving who the person is not. I have an ancestor named Charles CLARK. He descends from John CLARK. Charles CLARK had fathers named John. How can you be so sure that gentleman belongs to you? Note: The following example is hypothetical. No one came to me thinking he married Helen Smith. This is an example of what kind of questions another researcher may ask you and how the GPS helps you respond with accuracy. My Charles CLARK married Polly TROXELL. Careful analysis of available documents concerning the birth, marriage, death, and property held by this couple is necessary to prove MY Charles Clark was the husband of THAT Polly Troxell. Without proof of this simple fact, it is impossible to prove their descendants. The Clark-Troxell historian (insert any family historian here) must be prepared to defend the research conclusion in a number of ways to satisfy the one asking. a. Are you sure Charles Clark married Polly Troxell? Marriage License, Census Data, Last Will and Testament of Charles, Polly, or their parents may be used to establish the marriage is valid between these two people. If Census Data is the sole credible document then pairing it with a marriage license or will/probate records is needed to justify the researcher’s conclusion. b. Are you sure the Charles in those documents definitely belongs to you? What documents are in your possession to confirm the claim to Charles Clark who married Polly Troxell as your ancestor? CHECK COURT RECORDS, Certificates of Birth and Death, Property Records, Will and Probate Records. As one Credible Document enforces another the researcher builds a strong defense to support the research conclusion. c. Did you check for other marriage records? Check dates, county vital records, verify the date of death for Polly Troxell. Compare Polly’s date of birth, marriage, and death to this Helen Smith. Are there any conflicts? Write them down. Is there a marriage record for Charles Clark and Helen Smith? How does this fit with the rest of your information? Take great care to weigh and measure all available information. Do the dates of birth and death match? What is the age of Charles CLARK? Is he too young, too old, or the right age to marry Helen SMITH? Mismatches occur between generations when men pass names down to sons and grandsons. A Charles CLARK could be the husband of one Helen SMITH in another branch of family. This could also be a descendant of a man in another county or known family line of no blood relation to you. d. Did you verify all the children and grandchildren? Examine the Last Will and Testament, the Census Data collected on the family, carefully read all property transactions again. 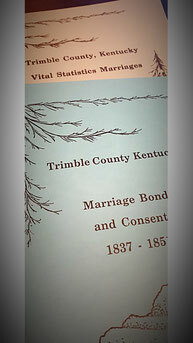 Consult Family Bible Records, obituaries, and search for newspaper articles for proof of all marriages and children of each ancestor in question. e. Where are the deeds for the old farm and other property transfers? Check the Deed Room at the courthouse in every county of residence. f. Pull every piece of information acquired to prove your analysis is correct. Use these documents to write your response to this inquiry. Remember to use GPS. Make sure all research is presented in a logical manner citing all credible documents used in your analysis of this family tree for Charles CLARK and Polly TROXELL. g. Review all research before answering this inquiry. Do not casually assume your documentation is correct. You must know beyond all doubt the research is correct. Would even a seasoned researcher do this exercise? Why go over this information again and again? People miss things. Everyone is guilty of some error at some time. If someone challenges your research, do not dismiss them out of turn. - Provide a reasoned response after a good look at your records. - Invite this person to share how they feel related to you. - Armed with your knowledge of family and local history, consider the ways in which you could be related (even if Helen SMITH never married your Charlie CLARK). - When someone reaches out, don’t smack their hand for questioning you. Open the door of opportunity and help this person find the right connection. They just want to find their family. Everybody wins here. Using the GPS (Genealogical Proof Standard) as a guideline for research helps produce the right conclusion and provides us with credible documents to prove our family history is right the first time. Another benefit to using the GPS in your family research is it introduces the method to those who may question your findings. Do you use GPS when documenting your family tree? I do. If you’d like to know more, I’d be happy to forward information to you. 4. Resolution of conflicts among evidence items. Resolving conflicts substantiates the credibility of the research. In genealogy, there are credible researchers and those who like to think they are credible. Do not fall into the second category. Genealogy is a collection of family facts not fairytales. If a conflict is found when analyzing credible documents, it must be resolved before moving forward. Without conflict resolution there can be no credible research. 5. Soundly reasoned, coherently written conclusion. ii. Employs knowledge of geography at the state and county level from settlement to county formation dates where said ancestors lived. 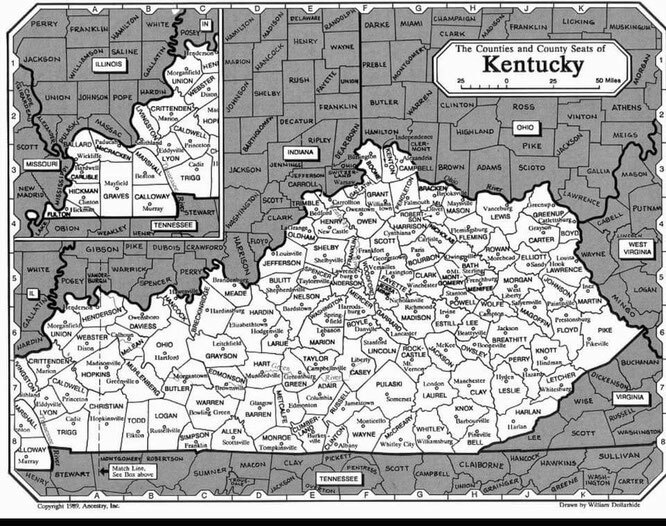 In the Commonwealth of Kentucky, a thorough understanding of the founding of our 120 counties is imperative. A settler in Fayette County in 1782 may have stayed there or moved. Land purchased in Lincoln County may lie in a different county today. The county line changed while one delegate slept through the meeting! iii. Understands migration patterns and how the journey impacts settlement and future moves, if any, for the family unit. iv. Knowledge of record systems and archives of the period. Who houses these collections now? Are they available to the public and what fees are involved in obtaining copies? v. Knowledge of arcane medical terminology. The common cold, influenza, and pneumonia are easy. Seeing ‘La Grippe’ on a death certificate might stump you. Read up before attempting to analyze death certificates from a bygone era. 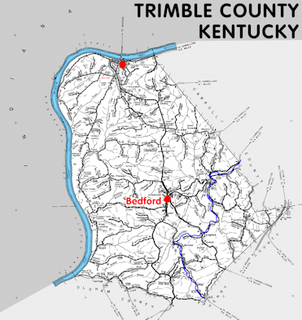 or our Facebook page, Historical Trimble County. 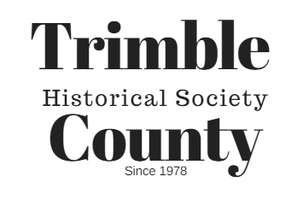 Send family research inquiries to trimblehistoryinfo@gmail.com.